The idea: Having a 10 cm cube helps you get to know how big millimeters and centimeters are. 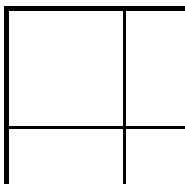 Here are pages you can print out, cut out, fold and tape, to make your own 10 centimeter box. Print at high resolution to avoid bizarre scaling artifacts (with the millimeter version). Print, cut out, fold, and then tape or glue. You can do half-and-half, combining one sheet of mm rule, and one sheet of cm rule. 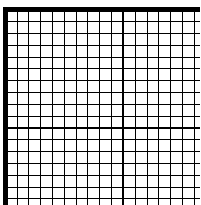 The grid lines are 1 mm, 10 mm (1 cm) and 100 mm (10 cm, 1 dm) apart. The centimeter-only version doesn't have the 1 mm graph. The PostScript versions were hand written. Feel free to modify them. The PDF versions were derived from the PostScript using ps2pdf, after conditioning with ps2ps. You might also be interested in Some printable paper rulers. This is the original version. It does not easily fold flat, is harder to assemble, and is less rigid. You need two sheets for each cube. So you can print twice, or photocopy. The tabs can be attached outside (easier), or inside (perhaps neater), or some combination of both. You can use plain paper or card stock (card stock is stronger). should be cut off on one sheet, and left on on the other (the choices are independent). and thus keep box tops shut. Or tab in slot? Is this tab set optimal? Can avoid rotating-to-fit exercise? Add alignment aid or description. Mark tabs to be pruned. Reconsider thinness of mm lines. Check effect of photocopying. Adding color might make it more attractive - a nice desk piece? Formalize half-and-half combined mm/cm version. Add tab outline to cm version? - No. 2003-Apr-04  Added a "box" version. Thanks to a colleague for the suggestion. 2002-Sep-07  Added link to `paper rulers'. 2002-Jul-24  Fixed tab positions. Old set didn't work. Oops.